Join us for the Gâteau au Chocolat workshop using rice flour (gluten-free). 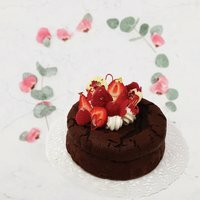 Norie Uematsu, a pastry chef at Cha-an Teahouse, will teach you how to make this perfect 6-inch size cake recipe for Valentine’s day from scratch! Gâteau au Chocolat is a French chocolate cake flavored with melted chocolate and cocoa powder which is also very popular in Japan. Please choose the day below. About Norie Uematsu: After graduating from Ecole Hôtelièr TSUJI Tokyo, Norie started her career as a Pastry Chef at Tokyo Hotel Numazu. Moving to New York in 2004, she further developed her skills working at many restaurants around NYC, including Maison Kayser. In 2017, she joined Cha-An Teahouse as Head Pastry Chef. TICrestaurant . 更新日 1月 09 2019 9:49 a.m.